We had a birthday in late November. I can't believe this, but I have a child who is now 28 years old. It just doesn't seem possible that he could be this old. Anyways, we had an on-the-day celebration, and we also had a bigger, Saturday night celebration. If a birthday falls on a weekday, I bake a batch of cupcakes for the on-the-day celebration. And then on the weekend, when we all have more time, we have the birthday cake. This is my all-time favorite, scratch yellow cake recipe, from my mother. I bake this cake for almost every birthday cake I make. Why? It calls for all-purpose flour, instead of cake flour. It never falls. It bakes a nice, slightly-domed top crust (no need to trim to set layers on top of each other). And it doesn't call for baking powder. You can use any solid shortening, but I think butter just tastes lightyears better. The layers can be baked days ahead, wrapped in plastic wrap and frozen. Then thaw on the counter for a couple of hours, and frost. As my son's birthday falls right as I'm turning my energy towards Thanksgiving, I bake the cake layers in early November, wrap, freeze, then pull out the day before his celebration, to frost. The cake almost seems to improve with the freezing of the layers. 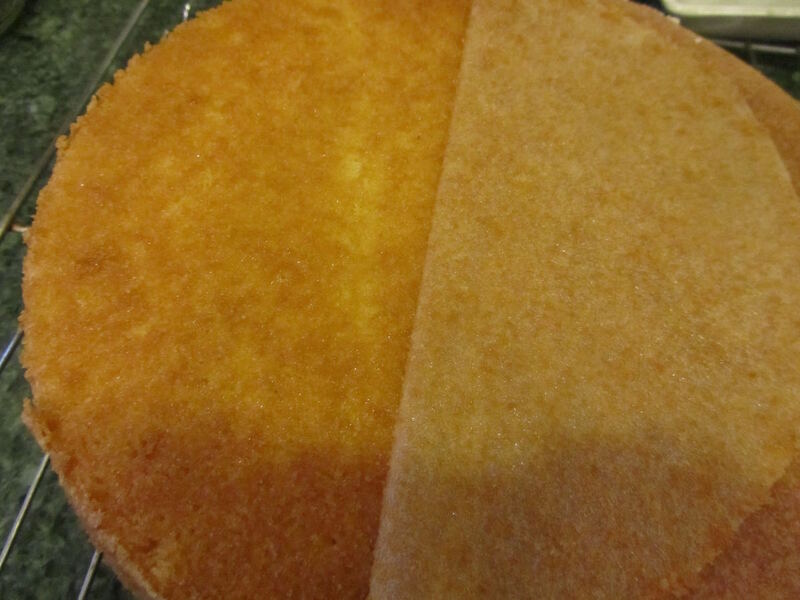 I can easily slice the 2 layers in half, horizontally, using a serrated knife, for making a four-layer cake. By the way, it may seem like a lot of extra work involved in buttering/flouring/lining a cake pan. 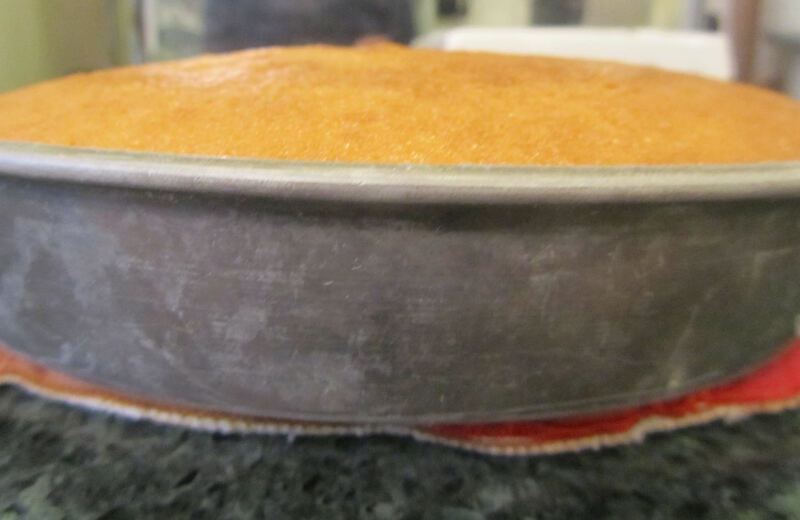 this is how my mother always prepared the cake pans, and they never, ever stuck to the pan. So I continue to follow her instructions on this. Here's the recipe for the butter cake. two 8 X 1 1/2-inch cake pans. I use aluminum cake pans, like my mothers. I found mine at a garage sale, years ago. You can bake in larger cake pans, but the layers will be thinner, and the baking time should be shortened by a couple of minutes. 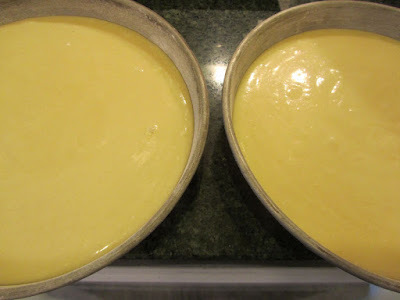 Butter and flour 2 layer cake pans. To flour a pan, put 1 tablespoon of flour into the bottom of the buttered pan. 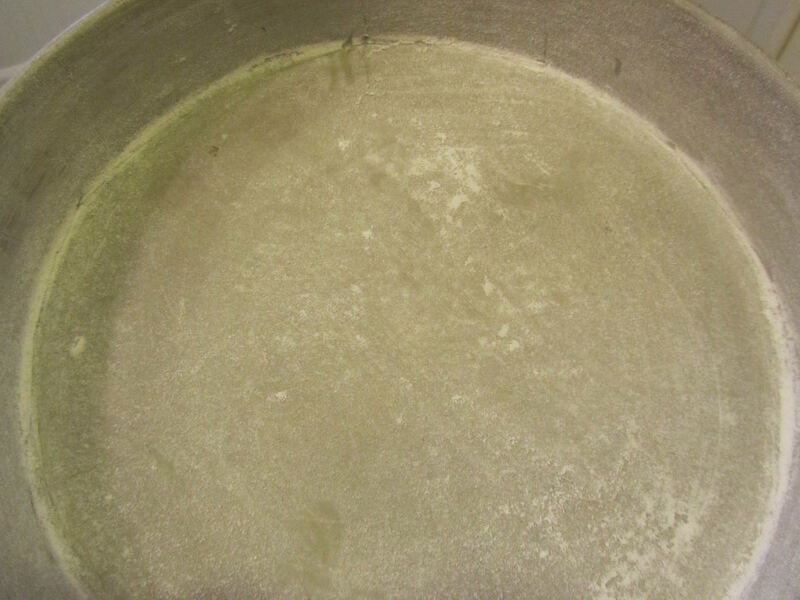 Shake from side to side, and tilt the pan, all around, to flour the sides of pan. Do this over the container of flour, tapping the last bit of flour back into the flour canister. Cut circles of waxed paper to fit in the bottom of each pan. To cut waxed paper, set the pan on a sheet of waxed paper, and use the point of a pair of scissors to "trace" the bottom of the pan's shape. Cut on that tracing. Place waxed paper circles in bottoms of prepared pans. In a large mixing bowl, cream the butter. Add sugar and beat until fluffy. Beat in eggs and vanilla. Beat in salt and baking soda. In a measuring cup, pour vinegar. Add milk to the 1-cup mark. Add flour and milk in thirds, alternately, until all is combined. Beat for 2 additional minutes. Pour into the 2 prepared cake pans. When done, place the pans on a cooling rack, trivet or hot pad. Allow to cool 3-5 minutes. Run a table knife around the edges of the pans. Turn the pans over onto the cooling rack. The cakes should come right out. Peel off the waxed paper immediately, and discard. Cool the layers completely before frosting or wrapping in plastic wrap to freeze. ***if you do not use vinegar, you can substitute 1 tablespoon baking powder for the 1 tablespoon vinegar plus 3/4 teaspoon baking soda. Then use 1 full cup of milk, in place of 1 scant cup of milk. For setting layers, if you want a really flat top surface for decorating, then place the top layer, upside down on the frosting covered bottom layer. When I just want a homey-looking cake, I set the top layer, right side up. 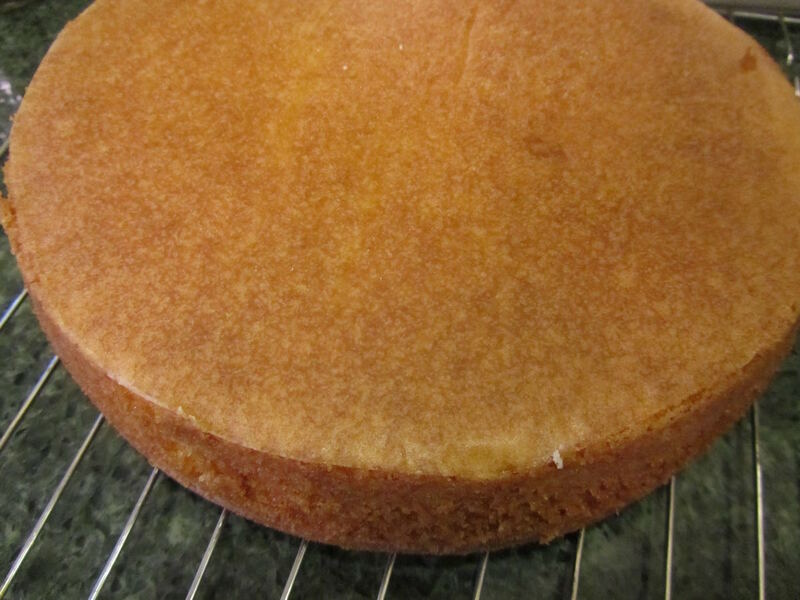 It gives the finished, frosted cake a slight rise in the center, which can look nice with a simple frosting. And now I'm hungry for cake! Very similar to the one I use. Differences are 1 1/2 cups sugar in the one I use, and baking powder instead of soda and vinegar. So good! Makes a great pineapple upside down cake, too. I've never used this as a pineapple upside-down cake batter. Have you ever made rhubarb upside-down cake? You are an amazing Mom to still make birthday cakes for your kids even at age 28! We stopped doing that a while ago already mostly because the kids are so busy that we don't hardly ever get time together for birthday celebrations. We do, however, enjoy the times we do have together. I would say my three kids waited in anticipation for each other to come home for Thanksgiving break and are now looking forward to Christmas break to be together. I am not close with three of my four brothers and I have urged my kids a long time ago to keep that relationship alive. So far so good! I think every family has their own individual way of recognizing each other' special days. making birthday cakes happens to be one of ours. I am sure you do your own special birthday recognition, in your house. So don't let what I do in mine make you feel any less amazing as a mom! Yum! Homemade white and yellow cakes are my favorite. I will definitely be making your recipe. We also prepared the cake pans like you do with the shortening/butter, flour, waxed paper when I was growing up, and I need to do that again. It really helps in getting the cake out of the pan in one piece. I like the idea of more layers too--more filling is a good thing! We've found that we really like using jam or jelly between some of the layers as it cuts some of the sugary-ness of the icing and cake. And yes, more filling is definitely a good thing!! The waxed paper really works. When I've taken short cuts and just buttered/floured the pans, they always stick in parts, sometimes breaking in half. So this works well for me. Looks like a great recipe, Lili. I do a lot of baking with soda rather than powder, and I never buy cake flour. (I only sift for rare special recipes.) For our family's tastes, this works fine. :) I do agree that the time to put parchment in a cake pan is worth it, too. After doing it a couple of years, it's just a habit. You're right, it becomes habit to use the paper lining in the pans. When I think about baking a cake, this is just part of it. I think the slightly-rounded tops looks homemade (which is a good thing, IMO). But I do like a totally flat surface for a more elegant look to cakes. I guess it all depends what I'm going for in the appearance of each cake. 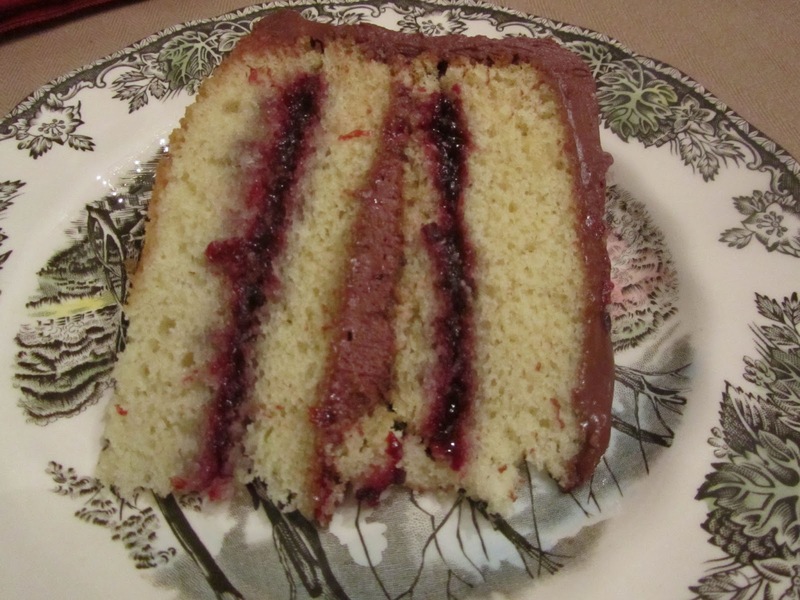 I love to bake, but layered cakes are not my favorite to make--but I'll eat them if offered to me! I love your jam layer--that seems more festive to me than all frosting. Oh yes, the jam is really tasty! I've also used canned pie filling in between layers, also delicious! Thanks so much for the recipe! Have you ever made it in a 13X9" pan? I find those are best for transporting cakes. Would you alter the baking time for that type of pan? I've never used wax paper - can't wait to try it out on a layer cake soon. Yes, you can bake this in a rectangular pan. I call those "picnic cakes". I think that's what My mom called them. LOL! But we do take them on picnics, so I guess the name fits! A 9 X 13 would bake for about 33-39 minutes, non convection. If a glass baker, adjust the oven temp down 25 degrees. I can't wait to try this recipe, it sounds delicious! I seldom bake layer cakes, and love the ease of baking cakes in 13 x 9, bundt or tube pans. I was wondering the same thing as Jo Ann. I think it would be okay to bake this cake in different pans if the baking time is adjusted. After all, cake mix boxes list different baking times for different pan shapes and sizes. Thank you for posting your recipe! My husband's favorite cake is yellow with homemade chocolate frosting. I will definitely be trying this soon. You can also do this as cupcakes. It makes about 20 3-inch cupcakes. 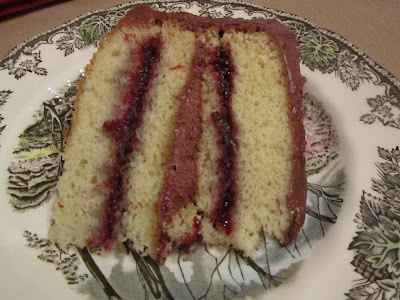 Yellow cake with chocolate frosting is one of our family's favorites, as well. We were talking about different combinations of cake flavor with frosting flavor, and this seems to be our preference. thank you! You're right, it is the kind of recipe most folks might have all the ingredients on hand. A lot of those older recipes (from the 50s and 60s) were like that. I've never used wax paper in the bottom of a cake pan. One of my friends did that once and the wax melted on the cake. That discouraged me. Have you ever had that problem? Most of our cakes are made in a 9x13 pan. For birthdays, they get embellishments. I've never noticed anything like wax residue on a baked cake. But then, I use cheapo waxed paper. It doesn't feel very waxy. I get it at Dollar Tree. You could also use parchment paper (no wax at all). When I pull the waxed paper off of the cake, it's much like using paper liners for cupcakes, a very thin layer of the cake's crust comes off on the paper. So, I'd assume that the majority of the wax from the waxed paper would be contained in that very thin layer. But I understand, a lot of folks don't want to risk any wax possibly getting on their baked goods, so opt for parchment paper, or use a soy-based waxed paper. And that works well, too. If you keep your eyes open, you can find pretty cheap parchment paper. It's much more available than it used to be, and some of the more-generic store brands do a version now, too, which saves a lot. I think the biggest roll/best price I found was a Kirkland product. Worked fine for what we use it for. 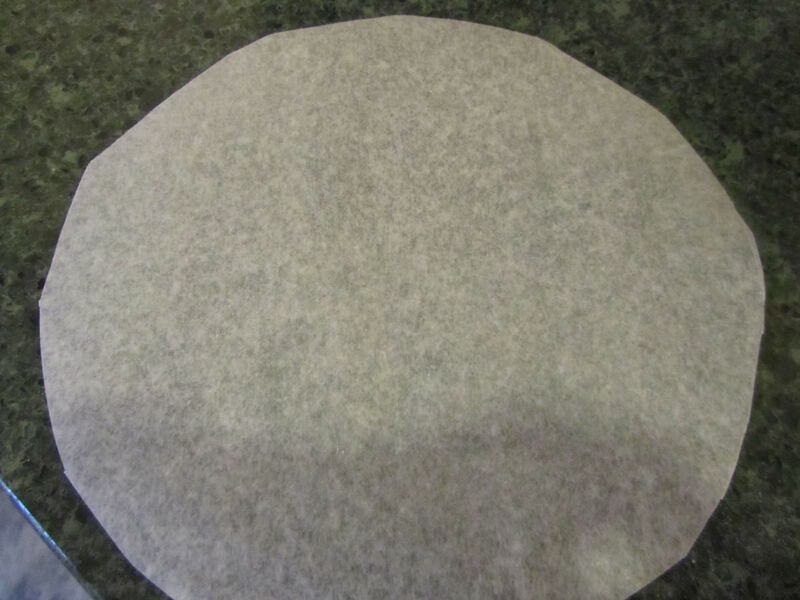 I personally don't cook with a waxed paper (soy or otherwise... don't like soy products), but find parchment a healthy, simple and relatively affordable alternative to both waxed paper and aluminum foil for many different applications. That said, I think I've had some of that waxed paper you were talking about, Lili. Not much wax there on some of the cheap ones! Yes! Our Dollar Tree carries parchment paper, and I see it at discounters like Marshall's and Home Goods, too!